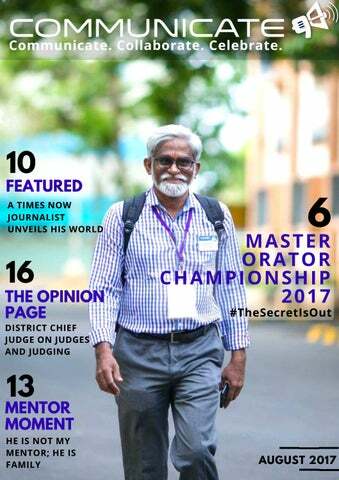 MASTER ORATOR CHAMPIONSHIP 2017 #TheSecretIsOut “Toastmasters is a 92-year-old organization. Yet how many people truly know about it, or the value it adds? It is still one the best kept secrets in the world. We want to change this and spread the word of Toastmasters.” - Unveiling MOC 2016 at Hyderabad. What began as a lunch conversation among a dozen District leaders has become a phenomenon. MOC 2017 Season 2 received over 2000 student registrations. The prelims were conducted in 7 cities across Andhra and Telangana. The Grand Finale was held at the Indian School of Business, Hyderabad. This is story of the Master Orator Championship, conducted by the members of Divisions E, F, and H of District 98. THE VISION A sentiment often repeated within our community is, "If I had known about Toastmasters when I was younger, my life would have turned out much differently”. This was the primary motivation of engaging the student community. When you get students interested in something, you engage with their parents, their faculty, and even their friends and relatives. This leads to an exponential benefit for all those involved. Instead of giving lectures and doing promotions, a contest is a more exciting path to take. MOC is modeled on the International Speech Contest, leading to structured learning among students and exhilaration for all involved. THE MEMBER VALUE PROPOSITION True Toastmasters are evangelists. Get four people in a room with one and they will get an earful within the hour. MOC offers innumerable opportunities to members to talk about Toastmasters. It gives opportunities to speak, lead, judge, organize, and spread the word. Now, while this is what Toastmasters do all the time, organizing a contest or conference in your own house is a relatively easy proposition. All those involved are after all, members. MOC offers a different challenge. Members have to speak to the student demographic, their families, teachers, friends, and college management. They have to work harder to convince those who are not Toastmasters to see its value. This enhances the members' persuasion skills. In keeping with our core objective of building leaders, MOC relies heavily on volunteers who do not hold District or Division offices, while operating with the full support of the Division leaders. This helps the District Officers to carry out their regular duties without undue burden and simultaneously exposes newer members to organizing and leading large events and teams. I caught up with the 10 finalists to talk about their MOC experience. The one thing that came up right away was “Breakfast should be added to the agenda”, met with enthusiastic nods from everyone present. There was a nervous energy as we gathered around the lectern on stage to talk. The briefing had just concluded and they had drawn for position. Each had arrived to the MOC stage from a different road - through a teacher, an alumni, a college senior, meetup group, posters, Toastmasters in their area, and previous years’ winners spreading the word. A theme that kept coming up as we spoke was how this was the first formal, professional event at such a prestigious forum, ISB Hyderabad, that they had all attended. There was high praise for the organizing team who had ensured a smooth, exciting, and tense contest at such scale. COVER STORY A contestant talked about how coming up with his own speech content had fired up all areas of thinking and imagination. Another talked about the networking opportunity, the chance to attend other such events in Toastmasters. They talked about expressing themselves, building confidence as introverts, and the opportunity to speak in front of nearly 400 people. "If we can move even one person, that makes this all worth it." CREATING STUDENT LEADERS “Today I am not here as a finalist, but as a Toastmaster!” said Yashna, the event host and finalist for the 2016 contest. MOC has created a new, rare breed of student leaders who have pulled of feats that we Toastmasters can only be amazed by. One of the colleges closely associated with MOC, BVRIT Hyderabad, chartered a college club after they saw the immense value the movement brings. The BVRIT students managed logistics for prelim rounds, leaving no stone unturned in the preparation. They visited colleges all over the city on their own to get more registrations. Bhavana and Reshmi from Guntur were finalists in 2016. After their experience, they wanted Toastmasters to come to Guntur so with some mentoring, they conducted 9 meetings in the city without any outside support. When the team approached them for Guntur registrations in 2017, they pulled out all the stops, getting over 800 registrations! These stories are repeated over and over in different contexts. This mega event in the Division E, F, and H calendar has transformed the lives of the dozens of members, students and families that it has touched. The Master Orator Championship is here to stay. The member without whom this event would not have been a reality, much less the spectacular success it is today, is the youngest Toastmaster you will meet, Venkata Dittakavi. As humble as he is visionary, he is the ideal we all aspire to be. When I asked him about the road ahead for MOC, he said that their initial Vision 2020 was 5000+ registrations across AP and Telangana. With 2000+ in the bag in 2017, MOC has set an even more ambitious target of 6000 registrations next year and a promise to spread to Mumbai and Pune. #TheSecretIsOut! Edited and compiled by Karan Take a moment to give us feedback for this article, or the issue HERE. You might get published in Letters to the Editor! covering both AP and Telangana. What is even more challenging is that Telugu media has several regional channels, more than any other state in the country. Hence, the national media also tends to pick up a lot of stories from these states. We work long hours, 6 days a week and on Sunday, when our body is craving for some sound sleep, could be when an important news breaks. There were days when I had to put aside my personal commitments and leave for work. However hectic it may be, the satisfaction of breaking a story and speaking for the people is what keeps me going. 3. You often report on controversial topics. How do you do this with sensitivity and professionalism? They often say in journalism that if your story doesn’t really offend anyone then what you’re doing isn’t impactful. Most often, powerful politicians are involved. There are days I’ve got calls from ministers’ offices asking me to not highlight the negative news. We only put in more effort to uncover the truth in such cases. Our work demands us to be in places which are dangerous. A building collapse, a site where a fire has happened, the epicentre of a cyclone, a train derailment are some locations where I have been lately. The bloodshed can send chills down the spine, the cries of people in pain can leave an indelible scar on you. But even then we have to stand and tell the world out there what exactly is happening. Being sensitive towards the feelings of people and sharing only verified information is something that all journalists are trained to do but sadly in the race against time, people tend to forget these golden rules. 4. What are the suggestions you would like to give Toastmasters on the essence of communication and leadership? There are two kinds of Toastmasters I’ve met - the first are those who are great orators and the second are those who are striving hard to get there. All those who actually find time to become a Toastmaster are those who have leadership skills and wish to hone them. I would advise members to not miss out on any opportunity that comes their way. Build contacts, communicate, and hone your leadership skills because you never know when these will come to your rescue. Edited and compiled by Sindhusha Take a moment to give us feedback for this article, or the issue HERE. You might get published in Letters to the Editor! TÊTE-À-TÊTE WITH CLUB GROWTH DIRECTOR, DTM LEO PAULOSE As we surge forward into the term, DTM Leo shares his vision of a strong and collaborative District 98. Can we focus on improving their experience thereby reducing our club losses and growing more effectively? Yes, we can and we will! > Clubs Supporting Clubs; #ClubLeadershipLessons I believe that a majority of all club related challenges can be addressed if clubs better collaborate among each other. Many times, it is this lack of collaboration and mutual synergy that keeps clubs from attaining their potential. I want to fundamentally change this and build revitalized connections among clubs. Imagine the awesomeness that we would be able to achieve if clubs depended on each other for support and guidance! The Club Extension Teams are a new concept introduced District wide. What purpose do they serve? We have amazing ideas that come from each part of our District. One such idea was the concept of "Club Extension Chairs" that Hyderabad introduced. This year, we decided to take this and roll it out across the District. > Differential Focus on Tier 1 and Tier 2 cities; #RevitalizedGrowthD98 For us to grow effectively as a District, differential focus on the various kinds of cities we have is critical. The same strategy is not applicable to all cities. Tier 2 cities require a different level of support and nurturing to take off. My aim is to help provide this additional support to upcoming cities so that they can achieve their full potential. We would like to add many new cities to our map. Let's become a truly diverse District! > Focus on Membership Experience; #BackToBasics For me personally, it's not about irrational growth but about effective growth. Yes, we need to increase our numbers but not at the cost of our member's experience. Each and every one of them is our brand ambassador. The main objective of these teams is to work hand-inhand with the Division and the Area Directors on new club leads. This serves two purposes: (1) Reduces the load from the District Officers and gives them more bandwidth to focus on other responsibilities. (2) Gives more members an opportunity to get exposure to club growth related activities (watch your mailboxes for e-mails!). We hope this change will help work wonders! What do you believe in - larger number of clubs or richness of member experience? It’s a blend of new members and richness of their club experience that makes our District great. It is time for positive change. Let's join hands and make awesomeness happen! Edited and compiled by Fatima Take a moment to give us feedback for this article, or the issue HERE. You might get published in Letters to the Editor! Being buddies with VPs and helping my club with contests and meetings was altogether a different learning experience. It helped me build leadership qualities which in turn restored faith in my capabilities. Helping our Secretary as a buddy opened doors to the creative world and its limitless potential. This role made me aware of the different artistic ways of approaching a simple thing like writing Minutes of the Meeting. The prepared speeches gave direction to my thoughts. They showed me how to start and end my conversation. Toastmasters gave me the platform where it was alright to fail, only to rise up again. MY GREEN ROOM There comes a moment in life when we realize we lack something in and around us and change becomes necessary to succeed. I always believed that I could give eloquent speeches. Later, it dawned on me that giving a speech in front of an audience and extracting information from an expert over the phone are poles apart. My work demands me to make multiple phone calls and extract information for my stories. Initially, it was a humongous task for me. Moreover, a stammering speech and nervousness compounded to a whole new level while interacting with industry experts. The revelation that I was a rookie in this world with little know-how about the subject matter was never my concern, but it was my fear of failing that was not letting me sprint towards success. This fear did not let me ask the next question as I thought that person at the other end will assume me to be a fool. It was only later that I learned that one of the key important traits of being a journalist is to be shameless. Toastmasters were thorough in its guidance on my road to be the shameless journalist. The role of Ah! Counter made me aware of the ‘Ah's’ that I used while having a conversation. The roles taught me to glue my ears to what the other person was saying. It’s been extremely helpful in garnering knowledge about my field from every word possible. Take a moment to give us feedback for this article, or the issue HERE. You might get published in Letters to the Editor! attracted praise. I once told him, ‘’Ravi Bro I want to be like you!” He replied, ‘’Instead of being Ravikumar be Rohan Patwardhan”. This reply gave me confidence and I feel nice that I am on track to becoming Rohan Patwardhan. The spark of positive motivation which Ravi lit in me was enough to become a fire. This is when I got to know why Toastmasters gives you Mentors. They show you how you are different. You are good. You will develop. Before I met Ravi my family was worried about my lack of confidence and the occasional bout of overconfidence. But after Ravi became my mentor, my progress chart always showed positive results. My parents were surprised to see my confidence on stage and asked how it had happened. The answer was obvious; only one name came from my mouth – Ravikumar. TM ROHAN PATWARDHAN, TOASTMASTERS CLUB OF PUNE Take a moment to give us feedback for this article, or the issue HERE. You might get published in Letters to the Editor! STRAIGHT FROM THE HEART TM Ashraf is the President of the Toastmasters Club of Pune South East. He has represented the club at both Area and Division levels, in Humorous and International Speech contests. This is his story, in his words. I had already made up my mind to join Toastmasters before attending my first meeting. Actually, I do not know whether I am an accidental or a natural Toastmaster. When I was at school, I was a very nervous and shy kid. Of course, I had friends, but I was quite reserved and would actually avoid people. But let me tell you one more thing. I have always had a loud voice, even as a schoolboy. One day—I was in 7th standard at the time—my teacher asked me to take part in a play for our Annual Day. Initially, I was reluctant but then I thought, “Let’s give it a try!”. As we rehearsed the play, I could sense my confidence growing. And then came the Annual Day. Everyone appreciated my performance. It was then that I thought I could be a good public speaker. There was no looking back. I took to public speaking like a fish takes to water. While I was working, I felt that I needed more public speaking opportunities. I decided to search for clubs and groups related to that. It was through the Internet that I found out about some ‘Toastmasters club’. I told myself, “Hey! This is wonderful. Here’s a club where I can practice public speaking and it’s there so close to my office and where I stay, right in my backyard!” That weekend I attended my first ever Toastmasters meeting and informed everyone that I have already decided to join the club. TM ASHRAFALI JAGIRDAR TOASTMASTERS CLUB OF PUNE SOUTH EAST This was the start of my Toastmasters journey, even though I had to wait for five weeks to formally join Toastmasters due to a technical issue. I got an opportunity to give my first speech in my second meeting itself. I was only too happy to get some stage time. 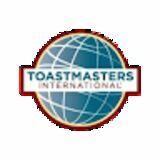 I have been an active and energetic Toastmaster for more than two years now. It has increased my confidence, helped me make a lot of friends, and given me a lot of fun. And I hope to keep on going and going! I would like to add one thing here: I am a Toastmaster because I really enjoy being a Toastmaster. It is my passion. When I give any speech or take up any responsibility, I don’t necessarily look at specific personal and professional goals. I just love it! As the President of TMCPSE, I have one message for new members. Toastmasters is what you make of it, so make sure to put in your best effort even as you thoroughly enjoy it! Edited and compiled by Taaha Take a moment to give us feedback for this article, or the issue HERE. You might get published in Letters to the Editor! RISING TO THE OCCASION In June 2016, I nominated myself for the post of VPEducation and in the interview, they asked me questions about being capable and being responsible. I answered confidently and was elected for the post. Little did I know that this experience was much more than what I was expecting. My tenure started smoothly with themed meetings, mentor mentee mappings in place and members benefitting from it. In August that year, for the first time in our club's history, the entire Executive Committee participated in the Club Humourous Speech and Evaluation Speech Contests, with good speeches and evaluations. For me, it was quite an achievement for the club! Soon came the time for the Joint Area Contest and our club, ADP Hyderabad Toastmasters, was chosen as the host. The Area Director turned to me to take the role of Conference Chair which I gladly accepted. Having three District Officers in our club was a blessing for me. I kickstarted the preparation with guidance and suggestions from my mentors Ravi, Surya, and Vamshi. First, I had to make a team and my mentors couldn't help me here as they had their own Area Contests to look after. I wanted the active Toastmasters of my club to help but most of them had won the Club contest and couldn’t organize the Area contest. I also did not want to hinder their preparation and thus could not seek their assistance for the Joint Area contest. So I requested TM Diwakar, the SAA of our club and some active members from other club to help and they obliged. Despite all the difficulties, I was finally able to put things in order with some help from the Division Director and my volunteers. All role players were in place, the preparations were complete and we were ready for the D-day! TM SUDHIR BATHAM MENTOR POOL MANAGER, DIVISIONS EFH But as they say, always expect the unexpected. It started to rain on the day of the contest, delaying the contest officials and participants. At the last minute, the Contest Chair met with an accident and could not report to the venue. Guided by our Division director, I immediately filled in for him and conducted the contest smoothly with help from the role players and guest volunteers. Everything went smoothly. I learned a lot from that contest experience and my tenure as the VP- Education. When someone asks me what I learned from Toastmasters, I say ‘Team Work’. I tell them I learned how to build a team; I learned to not give up; to ask for help; to keep moving forward despite challenges. This June, I completed my term as VP Education. I can say this for sure - I learned how to be a better person and a better Toastmaster. Edited and compiled by Disha Take a moment to give us feedback for this article, or the issue HERE. You might get published in Letters to the Editor! It could be a bit of each or even a combination of these factors. If we spend sufficient time on preparation and training, we can groom Toastmasters to be fine judges. We can easily take care of these challenges. But I think the bigger issue is apathy, a lack of commitment or the desire to serve. Why can’t we get 5-6 quality judges for a club contest, when we have over 200 Toastmasters trained in a city? Why do we have to depend on the same 20-30 members every time? > Can I be objective and score as per the criteria on the ballot? > Can I be fair and impartial, whether the contestant is friend or foe? > Can I mark solely on the contest performance and not on my perception of the contestant? I think it is time to address this problem. I think it is time for each one of us to volunteer and take on the responsibility of being a judge. Let us make it our mission to help in choosing that best, most deserving speech contest winner, every time. If your answer is YES to the above, ask the same questions with ‘Will I’ instead of ‘Can I’. And if your answer is YES once again, I think we have already found extraordinary judges and our contests will be in safe hands! One expects that the winner will be top ranked in most judges’ ballots. But this is often not the case. The winner could be one who is placed second or third on most ballots. Is there anything wrong with this? I don’t think so. Because the marks given for content, delivery and language will vary from one contestant to another and a few points could tilt the balance. A solution to this situation is to ensure that we have competent judges and possibly a greater number of judges. TM JYOTI HEGDE GOA YMCA TOASTMASTERS CLUB use of it even in her hour of need. Tina promised to change and convinced her tongue to return. From that day, Tina started greeting and speaking to everyone known. Tina and her tongue lived happily ever after.” Reya liked the story. She could relate to Tina. The visual image of the tongue talking to Tina made it more interesting than listening to a boring lecture. Since I found that telling stories works well while teaching kids life skills, I came up with a few more stories; 'DARE to Answer!' to answer questions in class, 'Battery Down! ', to eat breakfast and 'The Third Option' to understand the importance of self motivation. Instead of repeatedly saying “do this”, “don't do this”, it is more relaxing for both the parent and the child if the message is conveyed through stories. So the next time you want to share an important message with your kid, try weaving a story around it and see the difference! Edited and compiled by Taaha Take a moment to give us feedback for this article, or the issue HERE. You might get published in Letters to the Editor! Awake, breathe fire like a Dragon, Ignite the hibernating thoughts, I have come a long way but, something I lost down these roads. Oh! The things I wanted to do, that someone I wanted to be, those things which I once knew, the wind of time made it all flee. What happened? Someone asked, life happened is how I resolved, giving up on what I once dreamt, conforming to how the life evolved. T ogether we learn here, together we teach E veryone learning to practice what they preach R ising above excuses personal to each S uccess for all, yes together we will reach. Conscious to sub to unconscious mind, the path my dreams chose to follow, filling me with this world's facade, grabbing my soul, making me hollow. A peek into those dreams rocks my world, the sight of happiness and lots of cheers, now this dragon-fire shall light my path, eliciting zeal to live, a life beyond fears. Take a moment to give us feedback for this article, or the issue HERE. You might get published in Letters to the Editor! CONTEST OF THE MONTH Presenting the best PUNdits of our District! He slit his wrist for her. The doctor put him on IV. It was all in vein. When a male ghost saw a female ghost, it was love at first fright.